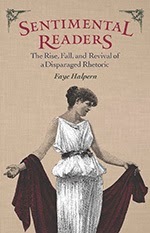 Faye Halpern is the author of Sentimental Readers: The Rise, Fall, and Revival of a Disparaged Rhetoric. She is an associate professor of English at the University of Calgary, and she lives in Calgary. Q: How would you define sentimentality, especially as it relates to the 19th century authors at the center of your book? A: With reference to the mid-century women writers I talk about (whom Nathaniel Hawthorne famously referred to as “the scribbling women”) literary critics have often identified “sentimentality” through the kinds of characters or plots: the child who dies too young, the reprobate converted to the right path, the family cruelly separated from each other but eventually reunited. But I noticed something about this way of identifying sentimentality: that one can find these characteristics in books that no one ever accused of being sentimental. I actually prefer the term “sentimental rhetoric” to “sentimentality,” even though it unfortunately sounds much more nutritiously academic (eat your vegetables, hapless readers!). However, the phrase does allow me to get at some things that really do, I think, distinguish these sentimental novels: for one thing, there’s their relationship to the (male) discipline of rhetoric and oratory, which was flourishing at the time these novels were published. The reaction these sentimental novels had to this discipline explains their own strange persuasive techniques. These authors were trying to create a particular relationship with their intended readers: they want their readers to identify so completely with their characters that the readers won’t register they’re reading a text (in the sense of artful representation) at all. Instead, their readers should be completely absorbed in what they’re reading, see it as artless and real. So I’m hoping to show that “sentimentality” is less about certain kinds of plots or characters and more about a particular relationship between author and reader that the sentimental authors strive to create. Q: You write, “In general, the sentimentalists further their own position in the battle of the sexes not by showing women to be the equals of men but by rendering men, especially good men, ridiculous.” How, and why, do they do that? A: You can see this move pretty clearly in Uncle Tom’s Cabin and The Minister’s Wooing: Harriet Beecher Stowe’s white male characters aren’t mean; they’re incompetent. They don’t know how to sew on a button or calm a howling baby, but more than that, their commitment to rationality and ignorance of issues of the heart and kitchen lead them to make basic moral mistakes. Senator Bird, in Uncle Tom’s Cabin, votes for the Fugitive Slave Act because he’s too committed to high-flown principles and political eloquence to see what’s really going on. It takes his wife, the extremely diminutive Mrs. Bird, to gently show him the error of his ways. Her lesson consists of the arrival of a beleaguered fugitive slave mother, Eliza, showing up at their door—Eliza’s distress allows the senator to realize how wrong he has been. He immediately offers to help Eliza in any way he can, and presumably this encounter will also cause him to vote differently in the future. Although I don’t know for sure why these authors depict privileged white men this way, it does seem a sensible strategy for a group of women who, in their efforts to reform their society, were committed to moral suasion rather than overt resistance (no separatist womyn’s community for them). The strategy has a real benefit: it shows that men are not actively resistant to women’s (better) ideas about human relations; instead, they’re simply unschooled in the areas in which white middle-class women were thought to excel: sympathy and morality. We’re quick to see the conservatism of this men-are-bumbling-idiots view—it’s reinforcing familiar ideas of what women are like and how they’re different from men—but you can also see its radicalism. As Jane Tompkins points out, Stowe makes the argument that if women were actually listened to the way they should be, society would have to be completely reordered and a kind of heaven on earth would be put in place. But beyond that, Stowe’s idea that it’s more ignorance than malice that was supporting the Slave Power seems to have been right: witnessing slavery via the scenes depicted in Uncle Tom’s Cabin really did galvanize a huge number of people at the time to become anti-slavery. Q: Can you discuss further what about the work of Harriet Beecher Stowe, and also that of Louisa May Alcott, makes it important to your argument? A: Stowe became a focus because Uncle Tom’s Cabin was so popular and so influential at the time and is still read and written copiously about today. That is, it has generated a lot of criticism, both contemporaneous and modern, which I was as interested in analyzing as the book itself. In addition, I love that the novel is so damn long. I think its length is a result of Stowe’s pedagogical aims. I realized after reading it a number of times that its incidents are repetitions of each other in the sense that they’re all trying to teach the same lesson: not just that slavery is wrong but how people can convince other people of their world view. It’s a comprehensive handbook on sentimental rhetoric. Louisa May Alcott became a focus because I see her as the direct inheritor of Stowe’s methods of persuasion, yet she inevitably modifies some of Stowe’s techniques. I’ve been interested in exploring what happens to sentimental rhetoric later in the century, when it is said to have faded from view (just like a consumptive sentimental heroine). With her interest in acting and in women’s work, Alcott invites, mostly inadvertently, a kind of skepticism about the authenticity of sentimental rhetoric that I think presages the response that a lot of modern day literary critics have to it. Q: You write, “I hope to convince readers that sentimental rhetoric is not as distant from us—or below us—as we might think.” How are today’s readers still connected to sentimental rhetoric? A: Of course, many readers are still moved by contemporary sentimental fiction and movies, but in the quotation above I was trying to say that even readers who think they’re too sophisticated to indulge are not above it. In terms of contemporary literary critics, I was suggesting that despite our tendency to unmask sentimental writers as shams or as shills for the status quo, we still might learn things from sentimental rhetoric. Stowe makes a pretty good argument against something that a lot of literary critics like: textual indeterminacy, the idea that literary interpretation is an endless process. Stowe shows us some of the bad things that can happen when someone has this view. She shows this via a character from Uncle Tom’s Cabin: Augustine St. Clare. St. Clare, the only ironic character in this novel, cannot take a stand against slavery and dies before freeing his slaves, and Stowe connects these moral failings to what we would consider his sophisticated reading practices. But there’s a more subtle way that we’re close to sentimental rhetoric when it comes to our pedagogy, how we teach beginning students how to interpret literary works. To explain what I mean, I first have to note that sentimental authors relied on the process of “identification” (even though they wouldn’t have used the term) for the success of their novels: the ability of a person to put him or herself in the place of someone else. Getting back to modern professors of English, we claim to hate when students try to “identify” with characters; it seems like a very limited and simplistic way to read a text. But I wanted to point out that even sophisticated critics very often “identify” in their own reading practices, not with particular characters but with what they take to be the author’s political or moral views. I’m advocating we look on students’ form of identification with less annoyance. We should see it as more continuous with what we professional literary critics do, and we should explain to students how their kind of identification differs—but not that much—from what many of us like to do ourselves. A: I’m not quite done with writing about Uncle Tom’s Cabin. I’m working on a piece that expands on an idea I touch on in the book: Uncle Tom’s Cabin as a literacy primer but with the twist that it’s actually teaching anti-literacy. Also, as I mentioned earlier, I became really interested while working on this book in what happens to sentimental rhetoric later in the nineteenth century. The going assumption is that sentimental novels are eclipsed by the rise of realism, which rejected sentimental modes of writing. Clearly, realist novels are doing some things differently from sentimental ones, but I don’t see it as a wholesale rejection. In Huck Finn, for example, Twain has a very funny send-up of a sentimental poetess, who spends her short life writing atrocious poetry about dead children and dead birds, and this attack on sentimentality diverts attention from Twain’s own sentimental rhetoric. You can see it in the scene when Jim talks about hitting his daughter, not realizing she’s deaf. Apart from the realists, I’m also investigating how Frederick Douglass uses (or rather, modifies) sentimental rhetoric. A: I have a theory that many of us modern literary critics do in fact cry at sentimental novels and movies but that we’d never admit it in our own criticism. It makes us seem like bad readers. I’ve been trying to collect anecdotal evidence about this, so if you’d like to add to my cache, please let me know: fhalpern@ucalgary.ca.